* Mariner 2 visited Venus in 1962. It was the first spacecraft to do so. Venus has since been visited by 20 spacecrafts. * Venus’ rotation is the slowest of all planets. It takes 243 Earth days for it to rotate. * Venus presents the same fact to Earth each time the two planets are at their closest point. * Venus is known as Earth’s sister planet because they are very similar in some ways. 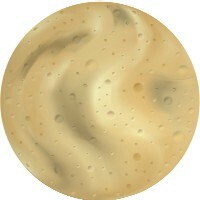 * Though Venus contained large amounts of water at one time, today it is a dry planet. Why? The water boiled away. Earth would have suffered the same fate it if had been closer to the sun. * The geographical surface of Venus is continual, rolling plain. Much of the surface if covered by lava flow. * The center of Venus is very similar to that of Earth. Its iron core is approximately 3000 kilometers in radius. The rest of the planet is made up of molten rock mantle. * Venus has a tale because it has no satellites. * Venus has no tectonic plates as Earth does. There is evidence of recent volcanic activity on Venus. * Venus is more extremely affected by the greenhouse effect than Earth. Why? Because Venus has a dense carbon monoxide atmosphere. * Venus appeared as a black dot crawling across the sun when it passed between Earth and the Sun on June 8, 2004. * Why have Earth and Venus evolved so differently when at one time they were so similar? Food for thought. I hadn’t seen your picture of Venus before. WOW. She’s lost her head, arms and legs, too! ps: She wouldn’t have needed tectonic plates, anyway. Without arms, she couldn’t cook anything.